Beautifully engraved certificate from the Contact Copper Company issued in 1915. This historic document was printed by the John Lowell Banknote Company and has an ornate border around it with the company's name on top center. This item has the signatures of the Company’s President, H. F. Fay and Secretary. According to Lee DeGood's Michigan Mining Book, there are less than 10 known copies of this certificate. Balance of assets December 31, 1912, $17,866. The Contact Copper Co. has continued diamond drilling exploration begun in 1910. Although several amygdaloids and one conglomerate showed small amounts of copper, the beds thus far cut have shown no marked degree of mineralization. 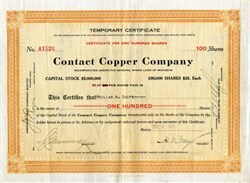 In November, 1912, the company bought all the property of the Elm River Copper Company at public auction.